. 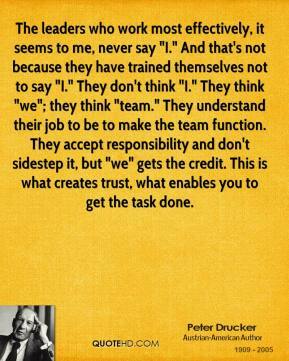 This is what creates trust, what enables you to get the task done. 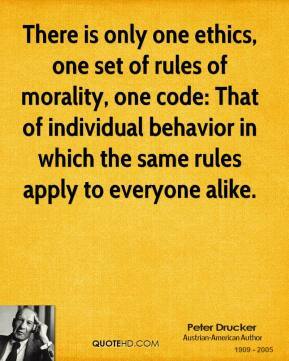 There is only one ethics, one set of rules of morality, one code: That of individual behavior in which the same rules apply to everyone alike. 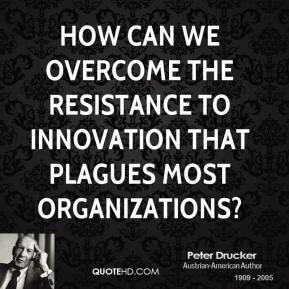 How can we overcome the resistance to innovation that plagues most organizations? The growth for education and training will be in continuing adult education. Online delivery is the trigger for this growth, but the demand for lifetime education stems from profound changes in society. We live in an economy where knowledge, not buildings and machinery, is the chief resource and where knowledge-workers make up the biggest part of the work force. 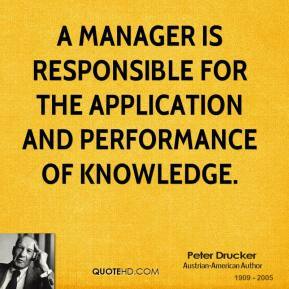 Quality in a product or service is not what the supplier puts in. It is what the customer gets out and is willing to pay for. 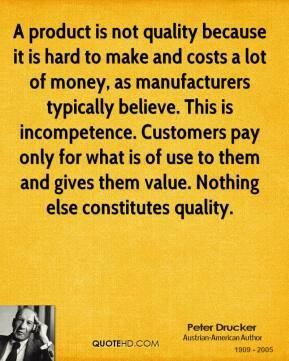 A product is not quality because it is hard to make and costs a lot of money, as manufacturers typically believe. 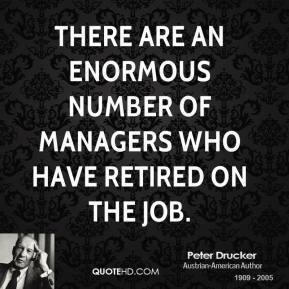 Management means, in the last analysis, the substitution of thought for brawn and muscle, of knowledge for folkways and superstition, and of cooperation for force. 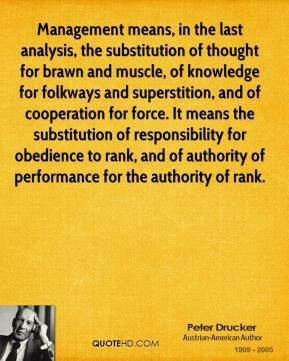 It means the substitution of responsibility for obedience to rank, and of authority of performance for the authority of rank. 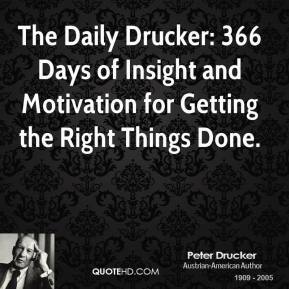 The Daily Drucker: 366 Days of Insight and Motivation for Getting the Right Things Done. People who don't take risks generally make about 2 big mistakes a year. 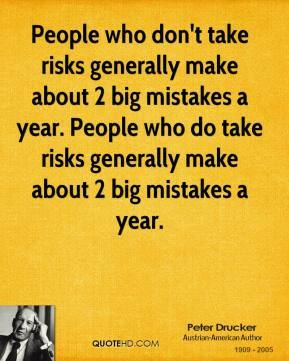 People who do take risks generally make about 2 big mistakes a year. 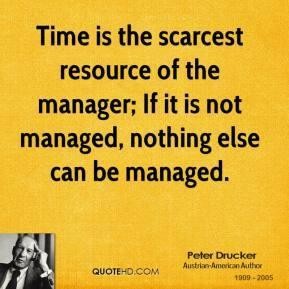 Time is the scarcest resource of the manager; If it is not managed, nothing else can be managed. 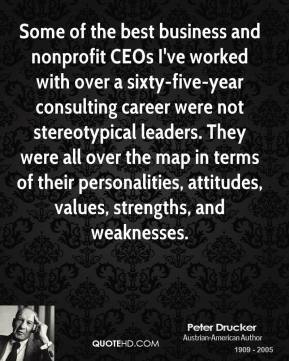 Some of the best business and nonprofit CEOs I've worked with over a sixty-five-year consulting career were not stereotypical leaders. They were all over the map in terms of their personalities, attitudes, values, strengths, and weaknesses. 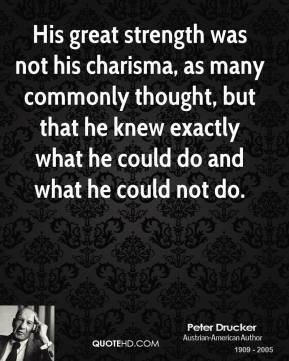 His great strength was not his charisma, as many commonly thought, but that he knew exactly what he could do and what he could not do. 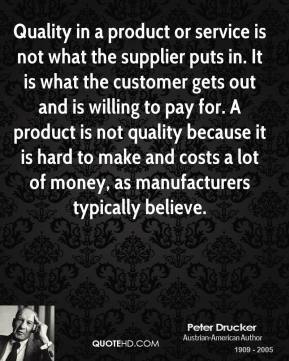 A product is not quality because it is hard to make and costs a lot of money, as manufacturers typically believe. This is incompetence. 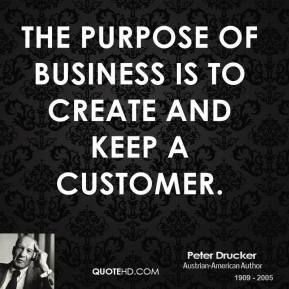 Customers pay only for what is of use to them and gives them value. Nothing else constitutes quality.